The holiday season brings wonderful tastes and smells, but often temptation to stray from our goals, too. With all the parties and family get-togethers, it’s easy to be overwhelmed or make poor food choices. I hope to help you stick to your goals while still enjoying all the flavors of the holidays. If you want to to eat grain free, Paleo, Primal, Gaps, gluten free, or unprocessed during Thanksgiving, I have good news – you can do it! For the next couple of weeks I’ll post pie, casserole, side dishes and other recipes to grace your Thanksgiving table. Of course, you will indulge, just remember to do it smartly. The Whole Nine gave some great advice last week. If you want to take a look at Thanksgiving recipes from years past you can check them out here. And if you want someone else to plan for you, then check out our Thanksgiving meal plans complete with a shopping list, recipes and step-by-step instructions. The filling can be made weeks in advance and stored in the freezer. 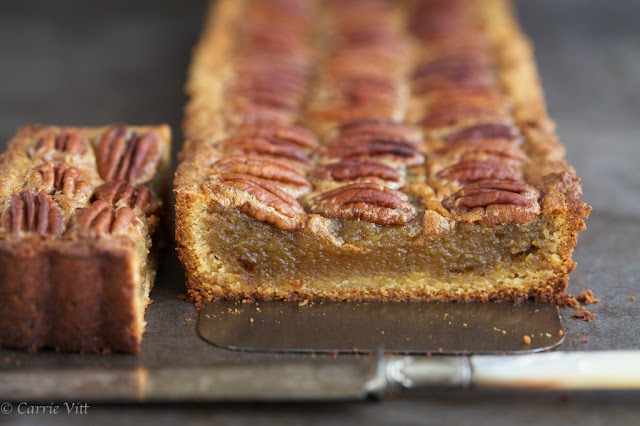 Thaw it completely before pouring into the pie crust and topping with pecan halves. If you're wondering why I consider maple syrup as "Paleo" read here . As with all desserts, remember to consume in moderation.? Place almond flour, coconut flour, gelatin, sea salt and coconut sugar in the bowl of a food processor. Pulse 2-3 times to combine. Add the butter to the flour mixture and pulse for eight 1-second pulses and then leave the processor on until the dough forms into a ball. (If dough is crumbly, add 1-2 tablespoons of water.) Press the dough on the bottom and up the sides of a 9-inch pie plate or tart pan. Place in the refrigerator to chill for 30 minutes. Preheat oven to 400ºF and adjust rack to lower-middle position. Heat maple syrup over medium heat in a medium saucepan. Simmer until syrup reaches 225ºF, about 10 -15 minutes. While syrup is simmering, place maple sugar and butter in a medium mixing bowl. As soon as the syrup reaches 225ºF, immediately pour syrup over sugar and butter mixture. Let mixture sit for 1 minute and then whisk together. Whisk in eggs, vanilla and sea salt (the mixture might look a little grainy at this point). Place prepared pie crust in pie plate on a large baking sheet. Pour mixture into your prepared pie crust and top with pecans. Cover crust with pie shield or foil. Bake for 15 minutes. Reduce heat to 350ºF and bake for an additional 15 minutes. The filling will be slightly less set in the center than the edges and it also might puff up in the middle, but will set as it cools. Serve slightly warm or at room temperature. 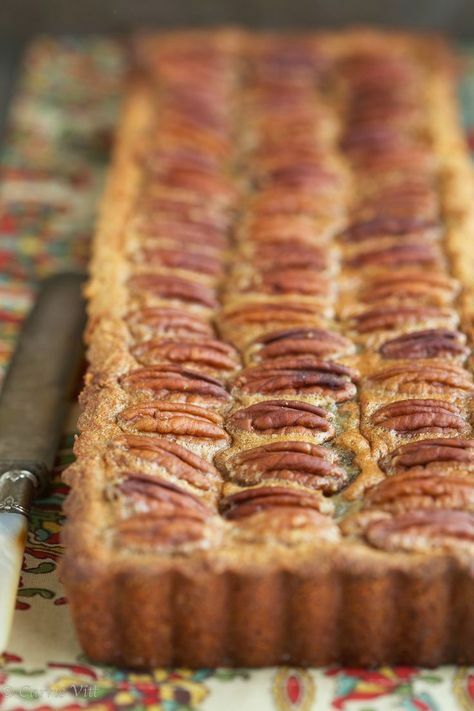 0 Response to "Pecan Pie without Corn Syrup (Grain Free, Paleo, Primal, Gluten Free) "